Many of the weighty difficulties which befall man have their cause, known or unknown, in his past. However, the causes of these weighty difficulties, let us say mental disorders, are nothing else than the transgression of the moral law of God. 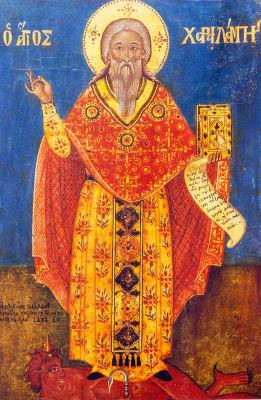 When St. Haralambos was being tortured, the persecuting emperor found out about his miracle-working power and ordered an insane man to be brought to Haralambos so that the emperor could be convinced that Haralambos could heal him. The devil tormented this man for thirty-five years driving him into the wilderness and hills and hurling him into mud or into gorges. When this deranged person approached Haralambos, the demon sensed a sweet-smelling fragrance emanating from this holy man and shouted: "I beg you, O servant of God, do not torment me before my time, rather command me and I will depart and, if you wish, I will tell you how it came about that I entered into this man." The saint commanded the demon to relate the story. The demon said: "This man wanted to steal from his neighbor and thought to himself: `If I don't kill the man first, I will not be able to seize his goods.' He proceeded and killed his neighbor. Having caught him in the act, I entered him and behold for thirty-four years I dwelt in him." 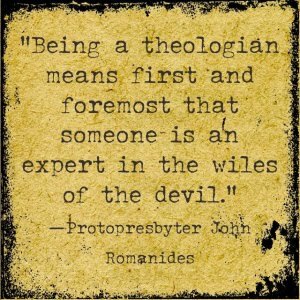 Upon hearing this, the saint of God commanded the demon to depart from the man immediately and to leave him in peace. The demon departed and the demented man was restored to health and became tranquil. 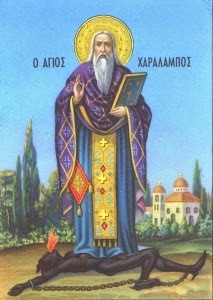 In the video posted here, Elder Dorotheos of Kornofolias Monastery in Soufli speaks about St. Haralambos and his miraculous power. This monastery has in its possession the incorrupt right leg of the saint. At about the 4:30 mark a woman who is demon possessed in the audience makes itself known. The Elder urges her to venerate either the relic or icon of St. Haralambos, but she refuses saying "I will not venerate" and she leaves. 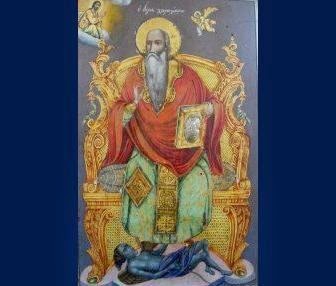 O Hieromartyr, athlete, champion Haralambos, your relics are a priceless treasure of the Church. Wherefore she rejoices, glorifying the Creator.